Working out in a gym is a great way to get in shape and stay in shape. Gyms have an array of equipment to help you meet your goals. Having a well-designed workout plan can get you moving in the right direction. You should warm up and cool down every time you work out. Warming up and cooling down help prevent injuries. To warm up, engage in about 5-10 minutes of gradually increasing activity. For example, if your cardio for the day is using an elliptical trainer, you should start on the lowest resistance setting and a comfortable walking pace and gradually speed up to meet your workout's intensity level. Cool down following your workout by performing an activity at a gradually decreasing level of intensity. Always leave at least one day of rest between strength training workouts of the same muscle group to allow muscles to heal. For more intense workouts with heavier weights, leave two days between strength training workouts of the same muscle group. Stretching is essential after every workout to improve muscle flexibility, maintain range of motion, and prevent injury. After a workout, you should stretch every major muscle group you used in the workout. Resting is extremely important when you work out. All of these workout plans contain very important days of rest, which allow your body to regenerate and recuperate from the demands exercise places on it. Don't skip rest days. If you do something active on those days, make it light activity such as walking or engaging in a fun recreational sport. Follow this beginners' workout for six to eight weeks. During this workout, you'll be easing your body into exercise by preparing your connective tissue (ligaments and tendons) for harder work and strengthening your heart and lungs. Use weights that allow you to perform two to three sets of 12 to 15 repetitions with some difficulty, but without reaching total exhaustion. In the beginners' workout, you will be focusing on strength training of the major muscle groups. Click to download a beginner workout chart. The leg press machine works the muscle groups of your thighs and buttocks. Gyms may offer either a seated leg press or a lying leg press. Either will work. If you have to lift any part of your body to move the weights, they are too heavy. Your body should remain stable and balanced throughout the movement, which should involve only your legs. You'll find this exercise as either a weight machine in which you sit on a bench, or by sitting on the ground using a low pulley and handle on a universal machine. The seated row works your lower back and mid back. The seated cable row uses a low pulley. Some gyms may also have a seated row machine. Either of these exercises will work well for the beginners' workout. To perform a pull down, you can use a bar attached to an overhead pulley on a universal machine. Pull downs work the muscles of your upper back, as well as your biceps and forearms. Note that if you have to arch your back during this exercise or use your legs, the weight is too heavy. This exercise can be done either sitting or lying, depending on the machine. The motion is essentially the same for both. Chest presses work your chest muscles, as well as the fronts of your shoulders and your triceps. If you have to arch your back, the weights are too heavy. This exercise works the tops of your shoulders, as well as your upper back muscles and triceps. A shoulder press is performed sitting at a machine. If you have to arch your back or use your legs, the weight is too heavy. These exercises work your abdominal muscles and help strengthen your core. You don't need any specific equipment to perform crunches. Some gyms have a crunch machine, but it's best to perform them without weights before you add resistance. You can use one of two starting positions for crunches. If you haven't done crunches in a while, use the beginner starting position. After a few weeks, you can switch to the advanced starting position. For the beginner starting position, lie on your back with your knees bent and your feet flat on the floor. Cross your arms in front of you and place the tips of your fingers on the opposite shoulder. For the advanced starting position, lie on your back with your knees bent and your feet flat on the floor. Hold your arms out to the side and then bend your elbows, placing the fingertips of your hands lightly behind your ears touching your head. 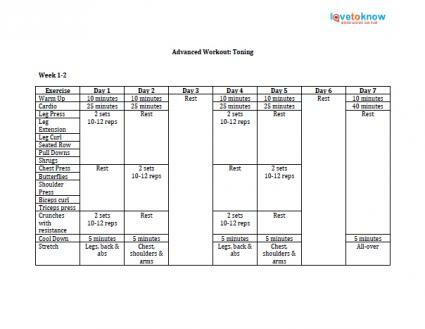 Two workouts are provided for intermediate/advanced training. The first focuses on building muscle, while the second focuses on toning and/or losing weight. The advanced workouts both use the same exercises. 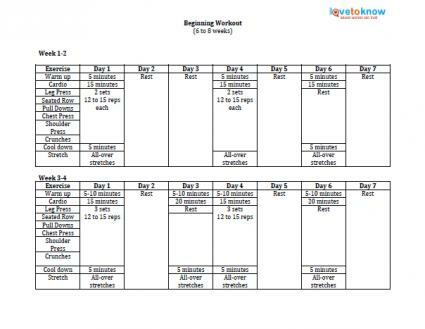 Click to download a toning/weight loss workout chart. Building Workout: This workout uses heavier weights and fewer repetitions to build muscle mass and strength. Weights should be heavy enough that you can perform two to three sets of about six to eight repetitions to exhaustion. You will find instructions for some of these exercises in the Beginners' Workout section. The rest are included below. Toning/Weight Loss Workout: If your goal is to tone and shape muscle and/or lose weight, then this program can help you meet those goals. Lift weights that allow you to perform two to three sets of 10 to 12 repetitions for each exercise. 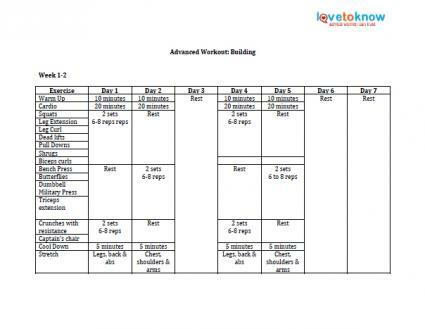 Click to download a building workout chart. This exercise uses free weights. When performing squats, be sure you use a weight belt and a squat rack and a spotter. If you are uncomfortable doing free weight squats, you can use a machine. However, free squats help increase core strength and stability, and work many large muscle groups including your glutes, thighs, lower back, and calves. This machine focuses on your quadriceps, which are the muscles that run along the front of your thighs. You perform the exercise while seated at a machine. If you have to arch your back or lift your buttocks, the weights are too heavy. This exercise is performed lying prone on a bench. It exercises your hamstring and gluteal muscles, which run along the backs of your thighs into your buttocks. If you have to arch your back or lift your stomach off the bench, the weight is too heavy. This free weight exercise develops the hamstrings and lower back. Use a long barbell to perform the exercise. It is essential you keep your back straight throughout the lift to avoid injury. Perform this exercise using equally weighted dumbbells with one in each hand. This exercise works the muscles of your upper back, called your rhomboids. If you have to arch your back or swing the weights, they are too heavy. This exercise works the muscles along the front of your arms, the biceps. It is a free weight exercise that uses a small barbell. Don't swing the weight or use your back. If you do, this is an indication the weight is too heavy. This is a free weight exercise performed lying supine on a bench with a barbell. Bench presses work your chest muscles, as well as the fronts of your shoulders and your triceps. When lifting heavy free weights, work with a spotter. If you have to arch your back, the weights are too heavy. You can perform this exercise on a machine that will either be called a butterfly machine or a seated pec deck. They are the same thing. This exercise works the outer and inner parts of your pectoral muscles. This exercise works the tops of your shoulders, as well as your upper back muscles and triceps. You use free weights to perform this exercise. If you have to arch your back or use momentum to move the weights, they are too heavy. This is a free weight exercise performed lying supine on a bench. Use a small barbell. It isolates your triceps muscles. Most gyms offer a seated triceps press machine with handles on either side of a seat. This exercise works the muscles along the backs of your arms, your triceps. If you have to use your back or come up off the seat as you exercise, your weights are too heavy. These exercises work your abdominal muscles and help strengthen your core. Some gyms have a crunch machine, but it's best to perform them without weights before you add resistance. This exercise doesn't use weights. Instead, you use a captain's chair bench, which most gyms have. It works your lower abdominals and obliques. Exercise is an essential component of meeting your goals for good health. 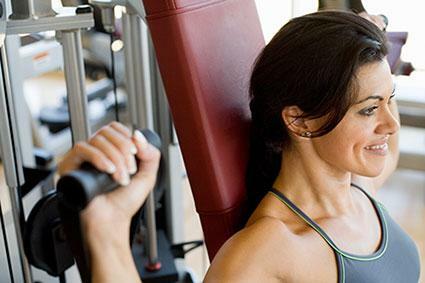 Working out at a gym and following a fitness plan can help you to achieve the level of fitness you desire.